As a guitarist, they don’t get more formidable than James Hetfield. Most people regard him as the throaty, ropey-armed singer and songwriter of Metallica. This isn’t untrue of course, but we feel a lot of non-musicians or ‘casual fans’ may often overlook just how beastly of a rhythm player he is. 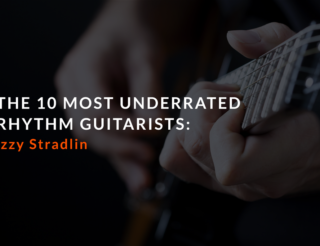 Make no mistake, Hetfield’s signature rhythm guitar is the single largest component of Metallica’s sound. Before we leap into technique and style, let’s quickly pass a lens over Hetfield’s tone. For guitars, his loyalty is split primarily between ESP and Gibson, the majority of which have been refitted with active EMG pickups. 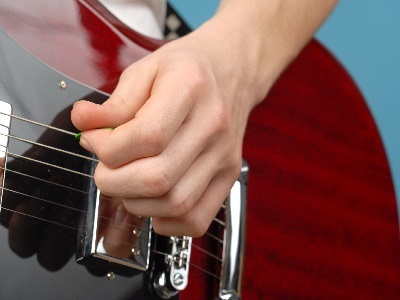 The use of active pickups is contentious among guitarists; although their higher output creates a bolstered and clearer sound, this comes at the expense of dynamic range. As a result, some argue that the tone from active pickups have a synthetic and somewhat lifeless or ‘sterile’ quality. You be the judge. In his storied career, Hetfield has used a spread of high-powered amplification, from modded Marshalls in the 80’s up to more modern and dedicated ‘metal amps’ like Diezel and Wizard in recent times. All of this equipment amounts to a heavy, authoritative guitar tone which defines Metallica. Hetfield is an exemplar of the downpicking rhythm style, which if he didn’t invent he certainly helped to pioneer. 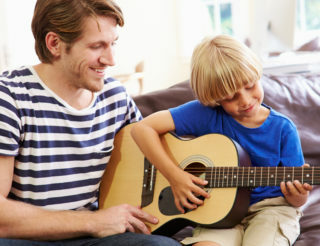 Downpicking is a right-hand technique whereby one strums the guitar using only downstrokes instead of the more instinctive ‘up-down-up-down motion’. Strumming may perhaps be too gentle a word here. A downpicker instead stabs downwards at the strings. For newbies, this may seem counter-intuitive and exhausting, even only for a few bars. To downpick an entire concert requires a gladiatorial amount of right-hand stamina seen otherwise only in competitive masturbators (they exist). At the expense of finesse and articulation, playing only downstrokes results in a heavier tone with more bite. Although ‘chugging’ had been around in various forms for decades, Metallica and other bands in the emerging Thrash metal scene used downpicking to create a crushing wall of sound without ever becoming bloated by adding gratuitous distortion. Want to play like Hetfield? Let’s start off easy and melodic. Here we have Metallica’s notable cover of the time-honoured Irish song ‘Whiskey in a Jar’, brought to pop consciousness in the 1970’s by Thin Lizzy. Metallica’s version is actually probably closer in format to Thin Lizzy than the traditional song, which had passed down through many generations of hapless alcoholics before becoming the classic it is today. A nice mid-tempo groove in D-standard for a deeper sound, this verse is played with power chords. The picking pattern remains constant under the chord progression (F, D, Bb, F). While the second guitar is a little more elastic with the rhythm, Hetfield remains solid throughout. Downpicking at low tempos should require minimal adjustment. At this stage just make sure you’re hitting all your strokes clean and evenly before we work up to the next exercise. Warmed up? The following exercise is demonstrative of the rigour and precision involved in downpicking. The first hurdle you’ll likely face is endurance. While the first exercise was a gentle introduction, playing 16th notes at speed constitutes a real workout for your picking arm. A good rule of thumb in learning new material is to start slow and gently bring yourself up to speed. This rule can of course be bent depending on how advanced you are in scale to how simple the piece is. Avoid the temptation to revert back to alternative picking, strong though it may be. Even if you’re lagging behind the beat, stay focused and the speed will come over time. It’s probably a testament to Hetfield’s rhythm badassery that we feel a disclaimer is needed here. I couldn’t honestly contrive a better way to develop R.S.I than repeatedly hacking your strings at a high tempo. It’s not a joke, and aside from being an utterly preventable injury to halt your practice for a few weeks, it also hurts like hell. It’ll also likely have a joyless knock-on effect on other parts of your life, assuming you use your hands frequently. Listen to your body. If you feel your hand or wrist starting to ache, stop immediately and shake out the ‘jip’. 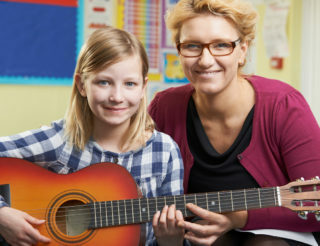 Muscle memory develops over time, so put down your guitar and let the practice ‘soak in’. For more general information on forming a practice routine, click here.